A recent ruling by the First District Court of Appeal (Amelia Island Restaurant II, Inc. v. Omni Amelia Island, LLC) protected a commercial real estate tenant’s right to maintain its exclusivity provision through each of its lease extension options as stated in the terms of its lease. 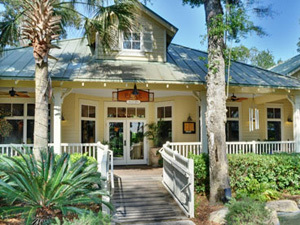 Amelia Island Restaurant II operated a restaurant (pictured below) in the Shops at Amelia Island Plantation in Nassau County. In 2012, the restaurant and landlord entered into litigation over its eligibility to renew the lease and whether the lease’s exclusivity provision preventing another full-service restaurant from operating in the Shops remained in effect. The trial court ruled that the restaurant could renew its lease for another five years, but the landlord prevailed on the exclusivity issue. Both parties subsequently appealed. The appellate panel affirmed the trial court’s ruling to allow the eatery to renew its lease, and it also reversed the lower court’s ruling on the exclusivity issue. The appellate court found that under the terms of the lease, the restaurant had an option to renew for a third five-year term in 2013 if it was not in default as of either the date that it gave the landlord written notice to exercise the option or on the last day of the first-option term. Both parties agreed that the restaurant was not in default on May 1, 2013, which was the last day of the option term, but they disagreed whether it was in default seven months earlier on September 25, 2012, which was the date it provided notice to renew the lease. “In sum, all of the evidence adduced at trial about the length of the Lease’s restrictive covenant, as originally negotiated by the parties, supports the conclusion that the exclusivity provision continues serving what the trial court considered to be an “[u]nquestionably” legitimate business purpose. This major appellate win for the restaurant tenant highlights the approach that the Florida courts will take in interpreting exclusivity provisions that are renewable under the option terms for commercial real estate leases. Our firm’s other real estate attorneys and I write regularly in this blog about important legal and business issues for the real estate industry in Florida, and we encourage industry followers to submit their email address in the subscription box at the top right of the blog in order to automatically receive all of our future articles.